A romantic dessert is the icing on the cake of a romantic evening. Most desserts can be altered to add romance, but there are other desserts that are classically linked to romance. Such desserts, including tiramisù, are appreciated around the world while others may be treats that you purchase from a local restaurant or bakery. Regardless, couple your romantic dessert with candlelight for a memorable evening. 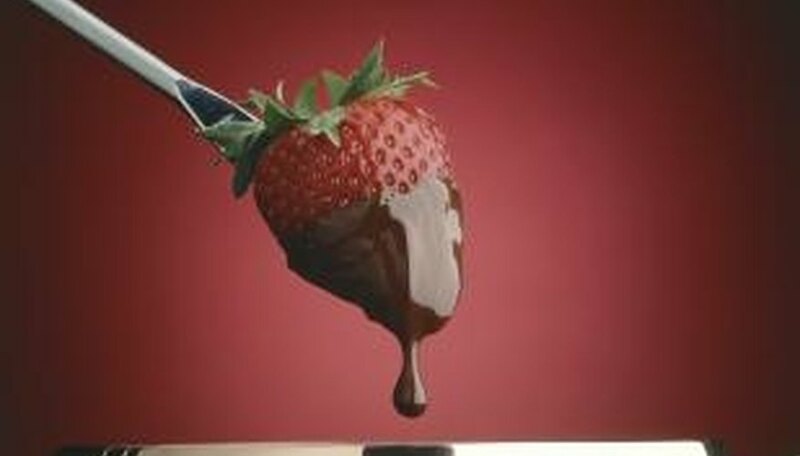 Chocolate fondue is a deliciously romantic dessert. Tiramisù is an Italian cake-like dessert made from coffee-dipped biscuits betwixt layers of a whipped mixture of egg yolks and mascarpone and flavored with coffee, Amaretto and cocoa. This dessert is typically associated with fine dining and its romantic appeal is undeniable because of its richness. With its silky texture and its pleasant aroma, tiramisù is a perfect end to a romantic evening. Chocolate is commonly associated with romance; after all, it's customary to give gifts of chocolate on such holidays as Valentine's Day. A dessert that combines decadent chocolate with fruit, nuts and candies is very romantic. And it's easy to make. Mix together and heat milk and sugar. Add bittersweet chocolate and allow the mixture to melt. Use the chocolate sauce to coat strawberries, bits of bananas, toasted almonds and rice cereal treats. For a romantic dessert idea, try red velvet cupcakes with a cinnamon-flavored frosting. The cupcake itself is a deep red color -- symbolic of love -- and the cinnamon flavoring in the frosting adds a special kick to the dessert. Top the cupcakes with heart-shaped candies and sprinklings of cinnamon. For an added twist, make miniature cupcakes and arrange them in a special way on a platter. For a change to the traditional creme brulée -- a romantic French dessert -- make a banana brulée. Coat a banana in brown sugar and carmelize it with a kitchen torch or the broil setting on your oven. Serve this decadent dessert as a sundae, complete with gourmet vanilla bean ice cream, fresh strawberries, chopped almonds, caramel sauce and mint leaves. This romantic dessert can be shared, so you and your sweetie can get even closer while you eat it. Adding wine to any dessert will take the meal to a new level of romance. But instead of drinking your wine, consider eating it by poaching cosc or anjou pears in a merlot. The product is sweet pears with a deep red color and a hint of wine goodness. Add flavor with cloves, cinnamon and vanilla extract. The color and taste of this dessert exude romance. Davis, Anne. "Types of Romantic Desserts." Dating Tips - Match.com, https://datingtips.match.com/types-romantic-desserts-8246424.html. Accessed 19 April 2019.